Up to 90 percent of golfer’s mistakes are the result of poor set-up. This month we take a look at incorrect posture and correct posture. This is defined generally by the excessive curve in the upper body as seen in Picture 1. Often golfers are unaware of this and, when it is shown either through video or photos, the response is generally one of disbelief. It is, however, important to note that many of us have jobs, such as deskwork, that unfortu­nately add to bad posture, not only for golf but also general daily function. Poor posture has other effects on the body such as tightening of the lower back and strain on the lower body; in par­ticular hamstrings and calves. Ultimately this means one main thing — the inability or dys­function of the body to play golf. Correct posture is defined in three areas. ❖1. The upper body. The goal here is to create as straight as possible spine angle, thus insuring the arms and hands are in the correct position. Once you begin swinging, the upper body can rotate correctly and therefore influences the correct path of the golf club during the backswing, downswing and fol­low-through. ❖2. The hip and pelvic area. During the golf swing it is this region that provides both counter-balancing and the torque used for creating power in the golf swing. In most cases (see Picture 1) this area is slight­ly inverted, compacting the lower region of the back and, as a result, tightening the lower back muscles. 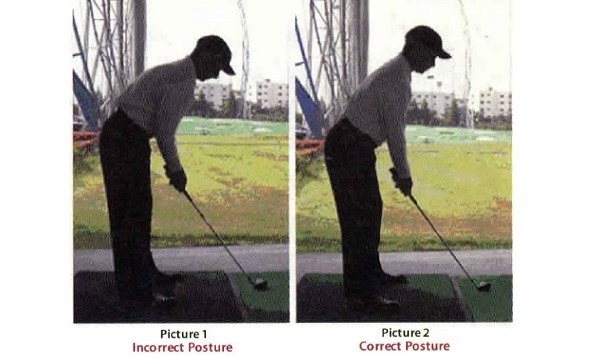 As Picture 2 shows, a slight extension (do not hyperextend) will release the tension from the result of Picture 1 and allow the body to be in an athletic position. ❖3. The legs. Note the legs are not straight, and they are not excessively bent. It is important the flexion for all golfers in this area should be such that you create a greater feeling of lower stability. This assists in relaxing the overall body before com­mencing the swing. So the next time you go to practice or play, be sure to take a look at your posture. The use of a camera, a mirror or even your reflection in a window will help you achieve a body shape con­ducive to playing good golf. The U.S. Open was held at Olympia Fields, Chicago, earlier this month. I was fortunate to attend this great event and expe­rience one of golf’s majors. Was Olympia Fields a worthy venue for the U.S. Open? Often a venue for a major golf championship is reflected in the scores. The U.S. Open again proved it is one of the worlds most difficult events, with only three players breaking par for the four rounds. Olympia Fields is a 36-hole venue. The North Course was used for the staging of the Open. It is a highly regarded course in the area, having hosted the Western Open and other events previously. During the week of the tournament, the quality of the course, facilities and the enthusiasm of the Chicago peo­ple made it, in my opinion, wor­thy of the 2003 U.S. Open. Who were the best players? Obviously, the eventual winner Jim Furyk deserves a mention for his stellar effort during the week. Other notable mentions should go to Steven Leaney (Australia), Ricky Barnes (USA), Trip Kuenhe (USA), Hunter Mahon (USA) and Chris Johnson (USA). The field quality of any major championship is always the best, and therefore all players who compete in such an event are the game’s best players. My advice to any golfing enthusiast or person curious about the ability of the world’s top players is to go to a major tournament. A few words of preparation though. Purchase tickets in advance, as often a major event is sold out. Go on a practice day, as this allows you to see the players with fewers crowds and, in some cases, get up a lot closer to the action. Also take lots of many to buy those great souvenirs only available at the venue. In the past six months a young 13-year-old girl, Michelle Wie, has captured the attention of the golfing world. Michelle resides in Hawaii, but is original­ly from Korea. She stands five feet, 11 inches, is able to drive the ball almost 300 yards and has just won the U.S. Women’s Public Links Amateur. We are sure to hear more from this young lady. The interest in Michelle is so great, she has been invited to play on the Nationwide Tour later this year. Like Annika Sorenstam, Michelle creates continued interest in the game of golf for women. This will also allow her the opportunity to see how good she really is against the men.